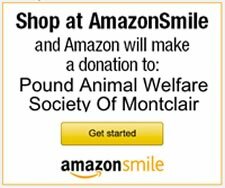 PAWS (Pound Animal Welfare Society Of Montclair, Inc.) is an animal rescue and sheltering group that has been serving Montclair and the surrounding communities for 41 years. Our organization focuses on at-risk dogs and cats throughout New Jersey. We maintain two small sheltering facilities (one for dogs and one for cats) as well as an established fostering network. Finding forever homes, spay-neuter, and humane education are all central to PAWS’ mission. Rescue and reduce are key principles in our work of finding animals good, appropriate, forever homes; preventing warehousing and/or euthanizing adoptable animals; changing public consciousness about the value of animals and our responsibilities to them; helping address the puppy mills issue; and promoting spay/neuter. Quality Veterinary Care – PAWS provides optimum veterinary care including spaying and neutering. Resource for Families – We have been successful in helping local families who have needed to relinquish their pets, but wanted to do whatever they could to ease their companion’s transition. By providing these families help with the screening process, we’ve helped animals land in the right new home, bypassing the shelter system. Humane Education – PAWS speaks at local schools at their request to speak about homeless animals. Valuable Networks – We network with other rescues and shelters as well. When we get inquiries for a certain type of dog, we are able to connect an adopter with another shelter who may have an animal that would be suited to that home. For the past few years PAWS has been conducting adoption days at the Verona NJ PETCO and West Orange NJ PETCO stores. We have been recognized as an Petco Adoption Partner; for several years now, regularly conducting onsite adoption events, and more recently as a Petco Charitable Partner.